»Let The Mind-blowing Mirzapur In Uttar Pradesh Intoxicate Your Sense Of Travel! Let us talk about the city of Mirzapur located in Uttar Pradesh which is an extraordinary amalgamation of exquisite carpet making, mud, clay pots, toys as well as brassware, along with alluring landscapes for the tourists. It is bordered by numerous hills and even serves as the headquarters for the district of Mirzapur. Mirzapur is significant for a few places such as the holy shrine of Vindhyachal, Ashtbhuja, Kali Koh as well as Devraha Baba Ashram. Mirzapur is also well-known for quite a number of natural spot and waterfalls. Did you know that it used to serve as the largest district in Uttar Pradesh before its separation with Sonebhadra happened? By Air - The airport of Varanasi is within closest proximity to the town of Mirzapur. It is just 60 km away. Next, most convenient thing would be to take a bus or avail a taxi towards Mirzapur. By Rail - Numerous trains pass from the Mirzapur railway station. It is a most convenient means of transport. Some trains going to Mirzapur include Bagmati Express, Chambal Express, Kolkata Mail, Kalka Mail, Puri Express, Magadh Express and Shipra Express. By Road - A bus service shall always be available from all the important towns of Uttar Pradesh to Mirzapur especially Varanasi, Sarnath and Lucknow. Of course, you shall want to visit the place when it is most pleasant in terms of the weather which are the months of November to April. Also referred to as Kajala Devi, this is one of those Shakti Peeths of India, a visit to which you shall treasure for a long period of time. A crazy crowd is attracted by the temple during the Hindu months of Chaitra and Ashwin while Navratri is celebrated with a pomp and show. The temple is visited by a lot of devotees during the wedding season in India. People find it extremely lucky and significant if a couple ties the knot with the blessings of Goddess Durga. In India, Shiva and Parvati are worshipped as one ideal couple and sheer proof of this togetherness is the worship of Ardhanarishwara. Situated right at the peak of the Vindhya ranges, the Ashtabhuji Devi Temple reflects a lot of significant history. The location of the temple is inside a cave and the beautiful spiritual building is devoted to eight-armed goddess - Ashtabhuji Devi. Did you know that she is an exemplification of Goddess Parvati? The temple is right beside Vindhyavasini Devi Temple and thus reaching both these temples from Mirzapur becomes quite easy and convenient. If you are looking to admire a waterfall quite close to Mirzapur, then the Wyndham Falls is your ideal destination where the pristine white waterfall shall blow your mind by gushing down the rocky steps. But why the name Wyndham? It is named after Wyndham, the British collector. However, the falls shall leave you all the more surprised by adorning a famous vantage point from where you can catch a spectacular view of the valleys and enliven your wanderlust soul. The Chunar Fort near Mirzapur serves as a paradise for the history buffs. It strictly follows the 'cleanliness is next to godliness' concept. You shall find a spectacular view of river Ganges from the fort. The fast-paced water-body meanders right behind the palace and the trickling music shall reach your ears from some parts of the river for sure. Deemed to be one of the most ancient forts, what makes the Chunar Fort all the more special are the interesting stories and legends narrated by the localites. What shall never miss your eyes is the British cemetery which is located exactly beneath the walls. And last but not least, it is one of the finest examples of ancient architecture. Join hands in front of this exquisite Mahakali temple. The Kalhikoh Temple is situated in the Vindhya mountain range. Located on a hilltop, it has an idol of Goddess Kali. It is an exemplary Hindu pilgrimage, that shall give you a serene and composed look as it is situated between tiny streams and thickened woods. How about getting to know such a place which shall remind us of the epic Ramayana? 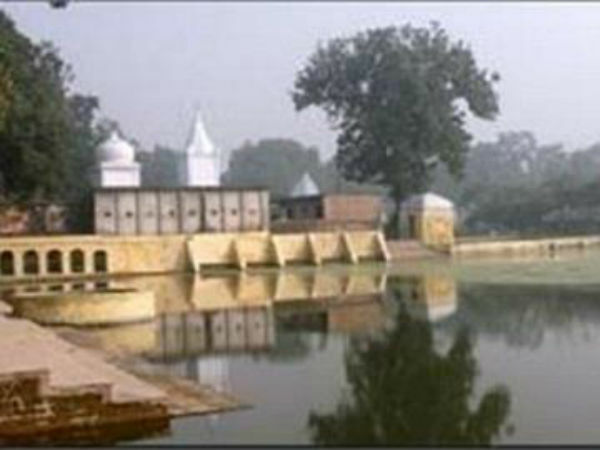 The Sita Kund near Mirzapur is one of the most respected places in the locality. It is believed that when Goddess Sita was on her way from Lanka, Lakshman desired the presence of water at this site and thus gave rise to a perpetual spring and is such a significant entity that people in love surely make it a point to visit this tank! Let's head to Mirzapur soon!